1. Place the sugar and blackberries in a saucepan and cook over a gentle heat for about 10 minutes, until the blackberries are very soft and have collapsed, giving a jam-like sauce. Remove from the heat and stir in the crème de cassis (if using), then set aside until cooled. 2. Tip the cooled blackberries into a sieve set over a bowl and squash them through using a wooden spoon. You will have a thick, syrupy sauce. Cover and place in the fridge to chill. 3. 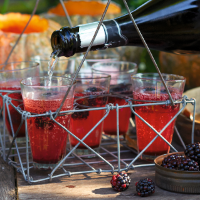 When ready to serve, place a few blackberries in the bottom of each glass, then add 2 tbsp of the blackberry juice. Top up with either chilled Prosecco or soda water.